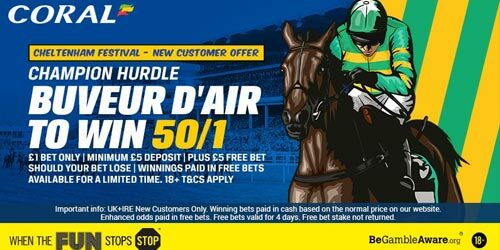 The Champion Hurdle is the feature race of the first day of the Cheltenham Festival and Coral are upping the ante on this race by offering a huge 50/1 Buveur D'Air to win, plus £5 free bet if you lose! Start your Cheltenham Festival with a boom! Coral offer 50/1 Buveur D'Air to win the Champion Hurdle at Cheltenham on DAY 1 + £5 free bet! Register a new account with Coral before the start of the race (3.30pm) and claim 50/1 Buveur D'Air to win the Champion Hurdle at Cheltenham on Tuesday 13th March 2018 - It's the best betting bargain on this race! Coral are offering all new customers a massive 50/1 Buveur D'Air to win the Champion Hurdle, click here to claim your price boost in less than two minutes! Available to punters from UK and Ireland only. Standard winnings are paid in cash based on price on Coral website. You will receive £5 free bet should your first bet lose. "Get 50/1 Buveur D'Air to win the Champion Hurdle at Coral"